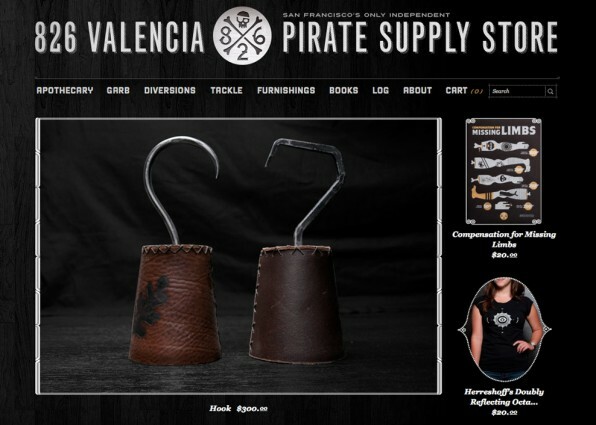 We’re proud to announce the launch of our new Pirate Supply Store website. The new website has everything to reinvigorate your childhood aspirations of setting sail and exploring the seven seas, especially if your plans for exploring the seven seas involve marauding and swords and eye-patches and scurvy. We’ve got hidden treasures to keep you guessing, stunning new photographs of our stunning merchandise—all adding up to a novel way to experience our store without, of course, actually being in our store. Since 2002, the Pirate Supply Store has not only served as the entrance to our tutoring center, but has also served as a unique fundraising tool for 826 Valencia. All of the proceeds from the store go towards 826 Valencia’s free student programming. There has never been a more unique way to provide support for young authors. We couldn’t have done this alone. Many, many thanks to the wonderful designers at Volume, Inc. and to Matt Glaser, our web developer at Squonk Studios, who spent countless hours making the site perfect. We’d also like to give a huge shout-out to our intrepid volunteer photographers William Campos and Peter Samuels. And, last, but definitely not least—most maybe—we’d like to thank the indomitable Amy Langer whose incredible project management (and photo-editing and joke-writing and sword-swinging) skills have made the website into a truly amazing thing. Go ahead and check it out! * Whether you’re new to 826 Valencia or an experienced visitor, we’re sure you’ll find the online home of Pirate Supply Store unlike any store website you’ve seen before. * If you’re still seeing the old Pirate Supply Store home page, never fear! Simply refresh the page and the new website will appear! This entry was posted in 826 News, Featured.